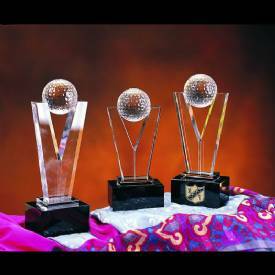 Product Description: This optical crystal stonebridge golf award has a smoothf ace and a golf ball set on top of the award.Plenty of room for engraving your text and/or logo on this crystal golf award. Pricing Notes: Text and/or logo engraving is included in the price. Color fill of text is available at an additional charge. Please see options below.